Magazine chips; sensitive SEMs; counting particles. Semiconductor manufacturing can produce tiny chips. The technology can also enable tiny magazine covers. For example, IBM and National Geographic plan to set a Guinness World Records title for the world’s smallest magazine cover. 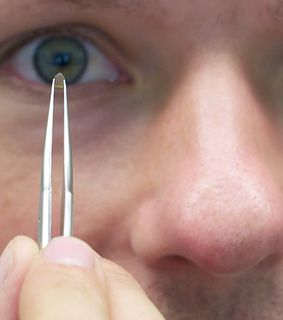 IBM has devised a tiny chisel with a nano-size tip, which is 100,000 times smaller than a sharpened pencil point. Researchers will use the tip to etch the magazine cover onto a sliver of polymer. The cover will be so small that 2,000 of them could fit on a grain of salt. The tip is similar to the kind used in atomic force microscopes. It is attached to a bendable cantilever. The tip can remove substrate material based on predefined patterns. The AFM-like technology has been licensed by IBM to a Swiss startup called SwissLitho. That company has brought out a desktop-sized tool to market under the name NanoFrazor. Using a concept called closed-loop lithography (CLL), the NanoFrazor is a tool for rapid-prototyping of nanostructures and nanodevices. For years, chipmakers have been using scanning electron microscopes (SEMs) for metrology and related applications. SEMs are sensitive and subtle movements can affect their accuracy. Seeking to solve the problem, Fraunhofer has devised a vibration-control table for SEMs. The isolation platform integrates sensors and actuators into a mount. This results in a platform that is more cost-effective and compact than its predecessors. Platform dampens vibrations in all spatial directions. Each of the platform’s four integrated swivel-mount modules contains a sensor. It measures any vibrations in all three directions and an actuator that counterbalances them in three dimensions. Particle counters are used in many industries. In the semiconductor industry, chipmakers would like to have more accurate particle counters in process control applications. North Carolina State University, the University of North Carolina at Chapel Hill and Marquette University have developed a new heat-based technique for particle counters. This is less expensive than traditional light-based techniques. A thermal particle detector was fabricated by combining a 500nm thick silicon nitride membrane. It also contains a thin-film resistive temperature detector with a silicone elastomer micro-channel. Particles with diameters of 90μm and 200μm created relative temperature changes of 0.11 and −0.44 K, respectively, as they flowed by the sensor. A first-order lumped thermal model was developed to predict the temperature changes. “We launched this study purely out of curiosity, but it’s developed into a technique that has significant advantages over existing methods for counting and measuring the size of microscopic objects,” said Glenn Walker, an associate professor in the joint biomedical engineering program at NC State and UNC-Chapel Hill, on the university’s Web site. There are three advantages to this technique. “It’s simple, it’s inexpensive, and it can monitor any kind of particle. Flow cytometry– which uses light–is both expensive and complex, while Coulter counters–which use electricity–only work on objects that don’t conduct electricity but are suspended in a solution that is conductive,” he added.